The Rangers continue to roll out a similar lineup despite them not being competitive over the last few seasons. The only real addition was Asdrubal Cabrera, who will get a bump hitting in Texas. He has been a decent hitter over the last few seasons, bouncing around the league. Joey Gallo is the big power bat, projected to hit 40+ home runs, but also will be a likely leader in strikeouts. Nomar Mazara and Shin-Soo Choo are better contact bats, but also bring some power. Expect them to be at the top of the order most nights. Elvis Andrus isn’t a power threat, but serves as one of the better contact bats Texas has. Rougned Odor has shown big power, but his plate discipline skills have been suspect. The pop is there on this team, but the patience at the plate is where they lack. 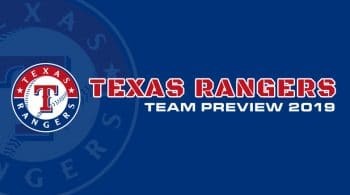 The Texas Rangers might have the worst rotation in baseball, and there is not a lot of positives to talk about when diving into their rotation. They haven’t seen Yu Darvish pitch regularly in a few years now, and his departure left them in shambles. Texas continues to try and add below average arms to the rotation from free agent signings, and because they are in a transition period, they can afford to do so without any real criticism. It is not going to be a pretty year for the Rangers rotation, and it will also tax a bad bullpen as well. The Rangers ranked 28th in baseball for team ERA last season, and a bottom five ranking is projected again for this staff and bullpen. Lance Lynn signing for the Rangers was a big concern with his splits in bad ballparks, and just overall against left-handed hitters. Lynn has moved around the last couple of seasons, and is projected for another season over a four ERA. He finished last season with a 4.77 ERA, but did have a tick up in strikeouts. Shelby Miller was the other odd signing, as his time in Arizona came to an end. It was spent filled with bad outings and a lengthy trip to the DL. Miller has had trouble against both sides of the plate, and moving to Texas is not going to do him any favors either. Mike Minor was a positive last season. He had good control, and had a 4.18 ERA on a bad Texas team. Minor might be a move that teams look at outside of Texas. He was rumored to be on the move at the deadline, and some good starts would put him back on the radar. He is projected for a similar season, and is the only real positive to talk about within this rotation. Drew Smyly and Edinson Volquez have both missed significant time with injuries over the last few seasons, and this is where they try and get their game back on track. There is no guarantee either come back to be their usual selves, so we could be looking at more lackluster talent at the end of the roster. On the other side, there is a chance we see them pitch well, and the rotation doesn’t look so bad.